Usually it’s the catchy names that get people talking about a product, but 1 UP Nutrition hopes to grab women’s attention with their lengthier label: 1 UP Nutrition Her BCAA’s, Glutamine & Collagen Plus Hydration Complex. It doesn’t roll off the tongue, but you sure know what the product is about from the start. Here is a review of this athletic and nutritional supplement for sporty women. One of the main trio of ingredients in this supplement are BCAAs, Branched Chain Amino Acids known individually as Valine, Leucine, and Isoleucine. 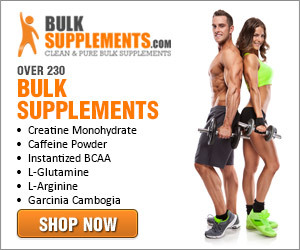 They are muscle builders, muscle repairers, and overall important supplements any male or female athlete should take. If you need to stack on more muscle weight, amino acids of several kinds perform critical functions. While they can be part of your daily diet, it’s often easier just to drink a shake where the ratios are already set for optimum effectiveness and in a format that’s easy for your gastrointestinal system to digest before exercise, during a short rest break, or immediately following a long routine. Glutamine also supports your muscles. Together with L-Alanine this pair facilitates rehydration and recovery at a faster pace so you don’t have to rest as long between workout sessions when your training needs are intense. You will have energy and won’t feel the burn as much as you would if you went without these nutrients. The entire collection of ingredients seen here has been chosen specifically to help women achieve their goals. They will build muscle more rapidly, experience less cramping in their muscles, and shed fat at an elevated rate too. This combination promotes enhanced focus at the same time. It takes some serious concentration to succeed when your objectives are as lofty as running a marathon or competing in a triathlon. Each serving of Her BCAAs by 1 UP Nutrition also contains 1 gram of L-Citrulline, an amino acid which could be beneficial to heart health. One gram of L-Carnitine L-Tartrate, another amino acid, supports your metabolism as it uses fat for energy. Working out does not always help you lose fat, ironically, because athletes often fail to supply carbohydrates and other fuel post-workout. The body goes straight for the muscles, deconstructing and cannibalizing them for fuel while fat just sits there. Many of the ingredients in this product prevent catabolism from taking place and encourage your system to utilize blood sugar and fat stores as energy instead, which is why this product is most effective taken close to workout time, intra-workout, or immediately after. L-Carnitine also supports circulation to make muscles bigger and stronger. Sustamine is a form of L-Glutamine which long distance athletes benefit from. It keeps the body hydrated and energized when demands are considerable. It also possesses anti-aging effects for the skin and energizes metabolism while enhancing muscle repair after intense weight-bearing activities, whether running or lifting. This is a drink mix powder sold in a 30-serving canister. Each scoop equals a serving. Blend it with water, juice, or even into a smoothie if you can handle a few more calories. This 1UP product is flavored and, since Watermelon Candy is sweet enough, you don’t need to add sugar. Mix well with a spoon or shake vigorously and drink. No other preparation is needed. Note that the information on this website has not been evaluated by the Food & Drug Administration or any other medical body. We do not aim to diagnose, treat, cure or prevent any illness or disease. The information shared on this website is for educational purposes only. You must consult your doctor before acting on any content on this website, especially if you are pregnant, nursing, taking medication, or have a medical condition.